Photo (Physics Central): Overview of the massive Superconducting Super Collider. In the midst of the Cold War between Russia and the United States science was a key strategic weapon. In order to maintain scientific supremacy in the 1980’s the United States planned to build the world’s largest particle accelerator. No one could have predicted in the early 1980’s that the Soviet Union would collapse at the end of the decade, thus bringing the Cold War to an anti-climactic end. Without the looming spectre of total nuclear annihilation to spur innovation the project lost its driving momentum. In the absence of strategic scientific necessity the ever inflating budget to operate the massive scientific apparatus sealed its fate. In 1993 funding for the project ceased despite an urgent plea by then President Clinton. 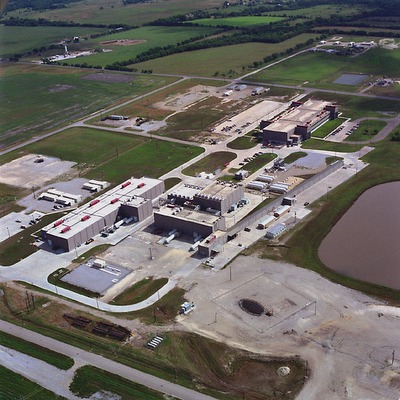 The Superconducting Super Collider on the outskirts of Waxahachie, TX, just south of Dallas, encircles the whole town. The seemingly odd location choice was in fact quite deliberate. The Department of Energy had chosen its site carefully. To mitigate the risk of hazardous material passing nearby, it selected land 5 miles from the nearest truck route and 4 miles from the nearest rail line. The collider is clear of flight paths and out of hurricane, tsunami, earthquake and flood zones. Before Congress removed funding for the project crews had already dug out up to 14 miles of underground tunnel and 17 shafts that lead to the surface. If the ring been completely dug out it the circumference would have been 54 miles. In the end this massive hole in the ground cost US taxpayers $2 billion dollars. Had the facility been completed, it would have been even larger than the Hadron Collider in Switzerland. An investment group snapped up the property in 2006 and has hired another firm to market it as a potential data center. Until that happens the colossal monument to American scientific investment fries in the sweltering Texas sun. BoingBoing – Orignal post on the physicists exploring the SSC. C-Span – Congressional debate over funding for the SSC. Damn Interesting – Article incorrectly asserts that President Clinton was not a fan of the SSC, but otherwise a good read. Ellis County Museum – Summary of the SSC and its scientific applications. Great Guy – An employee describes the accelerator first hand. Physics Buzz – A group of nerdy urbexers infiltrate the SSC. Pres. Clinton – Letter of support for the SSC from President Clinton. Summer of Science – An explorer makes his way into the abandoned SSC. Wired – 2009 article on the sale of the SSC with excellent photos.